A Yemeni man convicted of plotting and taking part in the bombing of the USS Cole in 2000 is to be freed from jail. Jamal al-Badawi will be kept under effective house arrest after pledging allegiance to Yemen's president. 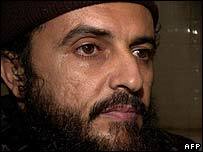 Badawi was sentenced to death in 2004 for his role in the bombing, but escaped from jail early in 2006. He handed himself in two weeks ago. The US, which lost 17 sailors in the attack on the Cole, has criticised the decision not to send him back to jail. A spokesman for the US National Security Council described Yemen's move as "deeply disappointing". "This action is inconsistent with a deepening of our bilateral counter-terrorism co-operation. We have communicated our displeasure to Yemeni officials," he said. No details of Badawi's release from jail were made public. However, one unnamed official told Reuters news agency that Badawi would remain "under close scrutiny and control of the security forces". Although he was condemned to death in 2004, that sentence had previously been reduced to 15 years in prison. In 2006 Badawi was among a group of 22 prisoners, including many suspected al-Qaeda figures, who escaped from a jail in the Yemeni capital, Sanaa. He turned himself in about two weeks ago, but remains wanted in the US, which has put a $5m bounty on him.